It's spring season here in USA. That also means, flowers are blooming everywhere. Even trees changing its color or leaves from winter season. Below is my entry for Mellow Yellow Monday and Ruby Tuesday, the beautiful spring flowers in the neighborhood. I was walking that time and I spotted this bunch of colorful flowers in the yard of one of the apartment complex. Yes, it's just one block away from the complex where DH and I stayed. So, not in the yard of our rented apartment home but a close-by, okay, a neighborhood. Beautiful flowers, isn't it? My blue and yellow entry. 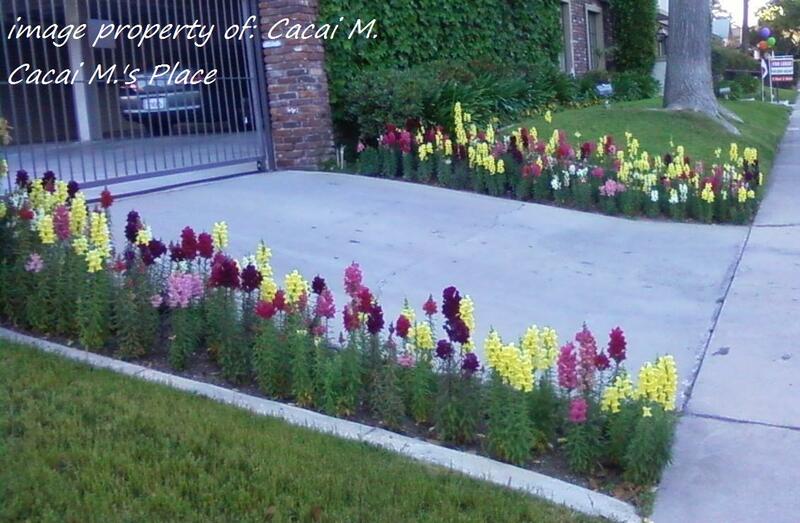 The flowers are pretty Cacai...Happy MYM! beautiful flowers! dropping by for MYM. have a nice day Cai! Yes, flowers are a plenty and colorful during spring time. The whole of nature becomes alive after the hibernating days of winter. Thanks for the post. God bless you all always. I love the flowers cai, inyoha nang gate diraa?